Windows is the most popular operating system with the most number of users. It is user-friendly with numerous capabilities that have made it the number one operating system. The more users means more Windows PCs and hence threat actors preferably target Windows PCs. There are numerous Antivirus and Free Antivirus solutions in the market. Some Antivirus solutions for PCs are quite effective, while most are traditional antivirus solutions that provide just virus-definition based security. Windows PCs must be protected from various types of malware such as viruses, worms, Trojans, ransomware, spyware, adware, bots, and Man-in-the-middle attacks and hackers. Hence, an antivirus solution is needed to automatically detect and eliminate the malware. There are three types of files encountered by an antivirus solution – known good, known bad and the unknown. The known bad files are detected based on virus-definition database based on a process called as blacklising and the effectivity of the detection is based on the strength of the database (the number of definitions and the latest updated definitions). These files are detected as malware and blocked or deleted by most antivirus solutions. Very few antivirus products maintain a database of good files (a process called as white listing). This is process intensive and requires considerable resources. These files are allowed into the system. The third type of file is the unknown file which can be good or bad. The capability of an antivirus solution can be rated by how it handles unknown files. Traditional antivirus solutions block only the known bad files while allowing all other files unrestricted access. 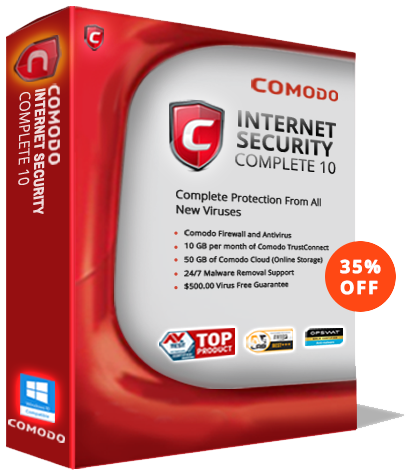 Comodo Free Antivirus is a part of Comodo Internet Security that offers total protection against both internal and external threats by combining a powerful antivirus, HIPS advanced host intrusion prevention system and packet filtering firewall. Unique Default-Deny platform – ensures that only authorized, safe applications enter your Windows PC. Containment – Auto Sandbox – All unknown files are automatically run in a sophisticated container to thwart zero-day malware. This container combines a virtualization of COM interfaces, Disk, Registry, and Memory. The unknown file can make changes only to the virtual system, and the behavior of the file helps decide if it is good or malicious. Unique feature – not available in any other AV. Provides protection against zero-day malware, ransomware, MitM and other types of advanced attacks. BitDefender is a reputed antivirus solution that delivers multiple layers of protection against ransomware and other malware. It uses behavioral threat detection to prevent infections and protects your most important documents from ransomware encryption. KAV is an antivirus program developed by Kaspersky Lab. It is an award-winning security solution that protects users from malware. The Norton AntiVirus Basic from Symantec is an Award-Winning Antivirus & Security product. Protects personal data against ransomware, viruses, malware, spyware, phishing, trojan horses and other online threats. BullGuard Antivirus provides powerful layered protection against all types of malware such as phishing attempts and trojans that try to steal sensitive credentials. It has a high rating and provides protection against ransomware. Game Booster feature optimizes CPU performance for smoother gaming. It blocks pop-ups and other interruptions. Safe browsing – Provides alerts and warnings about websites with malicious code. Unwittingly clicking on a link in a website with hidden malware could infect your Windows PC and data can be stolen. Ensures surfing in full safety. BullGuard checks and flags links that lead to malicious websites when searching in a search engine, or Facebook. Vulnerability Scanner – Vulnerability Scanner monitors and provides alerts about missing security updates, insecure Wi-Fi networks and suspicious connections. It blocks access points that could be exploited by hackers.